Former (and founding) director of Read Oregon, established originally as a consortium of 5 Colleges/Schools of Education (Eastern Oregon University, Oregon State University, Portland State University, Southern Oregon University, Western Oregon University). The consortium offered 24-credit Reading Endorsement program; 12-credit literacy education course of study for general classroom teachers; and courses-only option. Noah drew this picture of our house for a school project when he was in the 3rd grade. 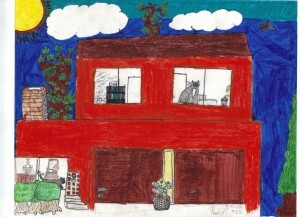 I loved that he drew a cat in the front and upstairs windows — and also drew the bookshelf in his upstairs room. This is the house we think of as the Z House.